My kids love yoga and it is fun to watch them practice their poses while participating in a physical fitness activity that is not only good for them but fun too. Angel Bear Yoga™ is a yoga program designed specifically for children and for “parents and teachers who care about our world.” Count me in! My kids and I are really enjoying the Angel Bear Yoga™ DVD, CD and Play Deck together. 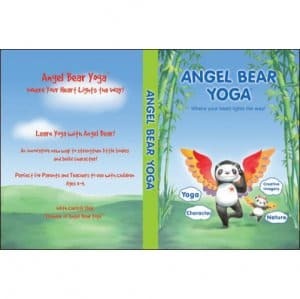 Angel Bear Yoga™ DVD is an adventure that teaches “listening” and “courage” through two live lessons. I really appreciated the calming teaching style of founder Christi Eley. All three of my children (two boys and a girl ages 3, 4 and 5) were excited to try this yoga DVD and they were not disappointed. They really liked the characters “Angel Bear” and “Sweet Pea” and readily tried all of the poses all while getting excited as they transformed into frogs and other animal poses. I even noticed that they did some of the poses in tandem and I must admit that I was impressed with how willingly they worked together to do this program. I also love how the DVD effortlessly incorporated nature facts and relaxation poses into the yoga program too. We do this DVD together each week as part of our fitness hour and they do one lesson each session (twice a week). This DVD is a real bargain at only $15.99 for a quality yoga program and more importantly it will get our kids moving! Angel Bear Yoga™ Adventure Stories Audio CD is another excellent tool in the program that promotes your child’s imagination and introduces meditation, relaxation and peace. The fact that it really works makes this CD priceless. We often play this CD just before bedtime……my children make a relaxing spot to lay down, close their eyes and simply listen to the grand adventure that they will take with their friends “Angel Bear” and “Sweet Pea”. There are an amazing 50 stories on two CD’s in this set and each story is 3-4 minutes in length! My kids absolutely love this CD and have on occasion pushed up bedtime (sweet!) so that they can listen to their CD. After listening to a few stories they are relaxed and ready for bed! 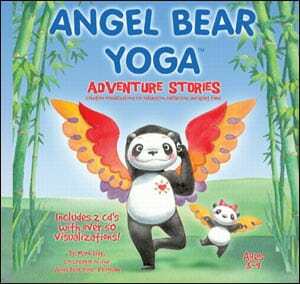 Angel Bear Yoga™ Adventure Stories-2 Audio CD set is only $19.99 and would make a wonderful gift idea! I can’t recommend this highly enough for its calming and relaxing visualization techniques. Though we have not tried this yet I am betting that this will be fantastic to take with us on a long car drive and plan to take it on vacation with us this summer. I highly recommend Angel Bear Yoga™ for children and parents/grandparents of all ages. You are invited to visit the Angel Bear Yoga™website to check out or purchase all of the products mentioned in this review. 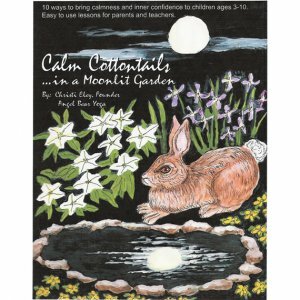 I also noticed the Calm Cottontails Main Lesson Book that looked interesting too. Angel Bear Yoga™ even offers Live Teacher Training, Online Training and Panda Workshops. There are even FREE downloads for you to take a look at too. The Pandas and Me Glass Bead Bracelet kit looks like something my daughter would love… and it’s so cute! I like the Sweet Pea Animal. Voted for you this evening.